Finding the right cold-weather camping gear is an important factor in having an enjoyable winter camping experience. Thomas Gooch, Product Manager at Eureka! Tents, took the time to share his expertise on choosing a tent and sleeping bag appropriate for winter camping, as well as providing other important winter camping tips. There are many factors to consider when choosing the ideal tent for your next camping trip. Full coverage fly: "The tent fly needs to come down to the ground to prevent wind and rain from blowing into the tent." Vestibules with ground flaps: "This will help hold the vestibule down to keep the wind from blowing up and under." Fly vent covers: "All fly vents should have covers so they can be closed in case of blowing snow and rain." Strong frame: "Four season tents should have a stronger frame than standard tents to withstand tougher weather conditions." 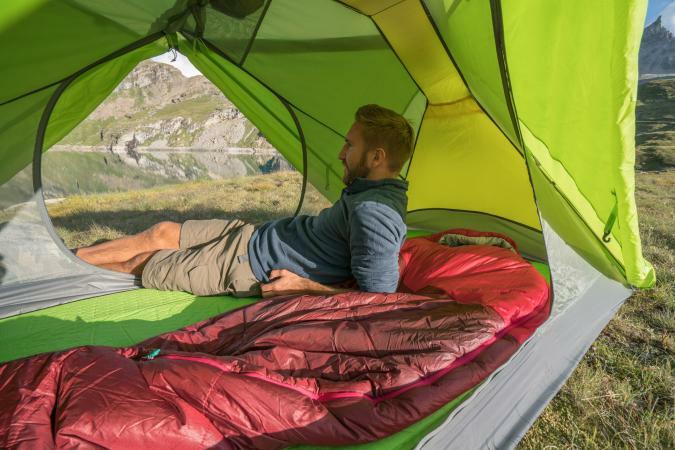 Breathable material: "Breathable material on the inner part of the tent allows the tent to breathe while still giving some thermal protection. This will also help guard against condensation." The type of tent you select will first be determined by how many campers you need to accommodate. According to Gooch, the Eureka Assault Outfitter 4 tent costs about $460 and is an excellent example of a four-season tent that will fill your winter camping needs. He states, "The tent sleeps four and weighs 13.5 pounds. Its domed shape allows it to easily shed heavy snow and rain while withstanding strong winds, which is essential for quickly changing winter weather patterns." Gooch continues, "Even for two campers, this roomy tent is an excellent choice. Keep in mind that you can store some of your camping gear outdoors in the summer, but in the winter you will want to keep it inside your tent. This should be kept in mind when you are tent shopping." Because most tents designed for cold conditions are created specifically with the needs of backpackers in mind, the majority are two-person tents. Eureka's Alpenlite two- person, four-season style is a popular choice. According to Outdoor Gear Lab field testing results, two other highly rated winter tents to consider include Hilleberg's Jannu and Tarra models, both of which are designed for two people and sell for just under $800 and $900, respectively, and the Black Diamond Firstlight is a two-person tent that costs just under $400. "Choose a sleeping bag with a temperature rating that you can trust. Big name brands know their bags will meet the temperature ratings they advertise." "Look for a bag with double-offset or shingle construction quilting. This means that no seams give the cold temperatures a direct path into the sleeping bag." "Choose a bag with an insulated zipper cover. Zippers will let the cold in if left by themselves." "A two-way zipper is an important feature. Since it is better to pack for the coldest temperatures you can expect to see, a two-way zipper allows you to open the lower part of the zipper for venting if it is too warm in the bag." "A trapezoidal foot box is a good option. This fits around the natural position of a camper's feet without allowing them to press up against the side. Feet usually are among the first things to get cold. If your feet press against the bag, it reduces the insulation of the bag." "A storm collar keeps warm air from escaping through the top opening of the bag." "A good hood to fit around the head where most heat is lost is an important key to staying warm." According to Gooch, a winter sleeping bag should be selected based on the features mentioned above and the weather you anticipate experiencing. He states, "If any type of wet weather is anticipated, use a synthetic insulation. Down does not work when it is wet." 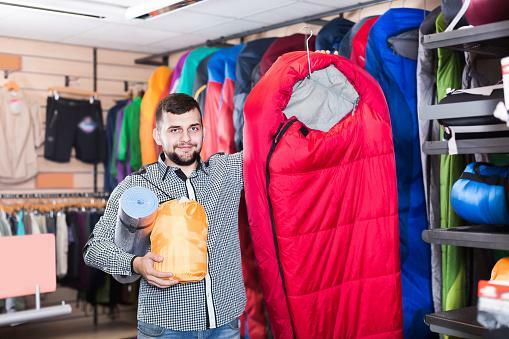 According to user reviews on Trailspace.com, some of the best sleeping bags for subzero temperatures are made by Feathered Friends and Western Mountaineering. According to BackpackerTest.org, Eureka also offers highly-rated cold weather sleeping bags that perform well in long-term field testing. Feathered Friends: This high-quality bag is for serious outdoor enthusiasts who frequently camp in subzero temperatures. It will definitely keep you warm, but comes with a hefty price, with models ranging from just over $675 to just under $1000. Western Mountaineering: Sleeping bags from this company are also designed for those who are quite serious about winter camping. Sub-zero options are priced similar to Feathered Friends models, with those designed for cold temperatures above zero run about $300. You don't have to delay camping until the weather turns warm. With the right equipment and preparation, you can have a great time camping out when the temperatures are chilly. Get organized with a winter camping packing list and you'll be on your way to a cold weather outing that you'll remember for a lifetime!